I hope everyone had a relaxing "Thanksgiving" weekend. I know I did, spending my days reading and collecting maple leaves for the Leaf Banner Project I started with Grade 1 today. I thought I'd start things off this week with a review and giveaway. 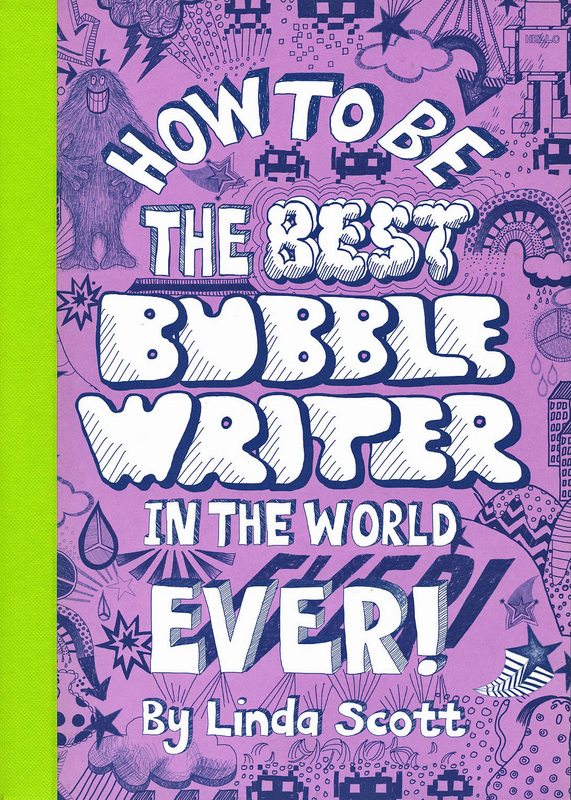 "How To Be The Best Bubblewriter In The World Ever" is a new book by Linda Scott. My friends over at Raincoast Books supplied me with a copy to review and another for one of you lucky readers to win! Linda shows you how to make 36 different alphabets ranging from "Hairy Monster" to "Space Invaders". Very cool and I can envision lots of projects already. She also includes pages for you to make your own cards, party invitations, bookmarks, comics, signs, etc. Within an hour of receiving this book my kids were already fighting over it. My 13 yr old used it for a poster she needed to complete for homework, my 11 yr old was writing "space invader" everywhere and my 8 yr old wanted to fill in every blank. I was especially thrilled by the 8 yr old who is struggling with penmanship at school. The fact that he wanted to practice printing styles floored me. He even took the book to the cabin this weekend to get a little more "practice" in. ( a Mom's dream come true). You can also comment or "like it" on my Facebook page as an entry. I will make the draw on Friday, Oct 14th so you have till midnight Thursday. This draw is open to US and Canadian residents only. Love bubble letters...remember doing that for hours when I was a kid, now mine love to write like this :) FUN! 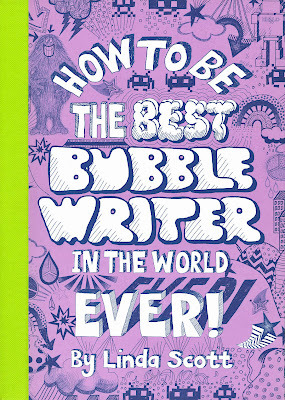 I have always wanted to know how to bubble write. I don't seem to have the knack.....so you see, I really need this book....My art students would love it too....and I promise to share! I loved making bubble letters as a kid! So fun! I almost passed this by, I mean, what exactly is a bubble writer and who wants to be the best. Well, the template for a fold n mail card hooked me and the kids I work with would love this. So enter me and let's see if I can be a better bubble writer. I love all different kinds of scripts! 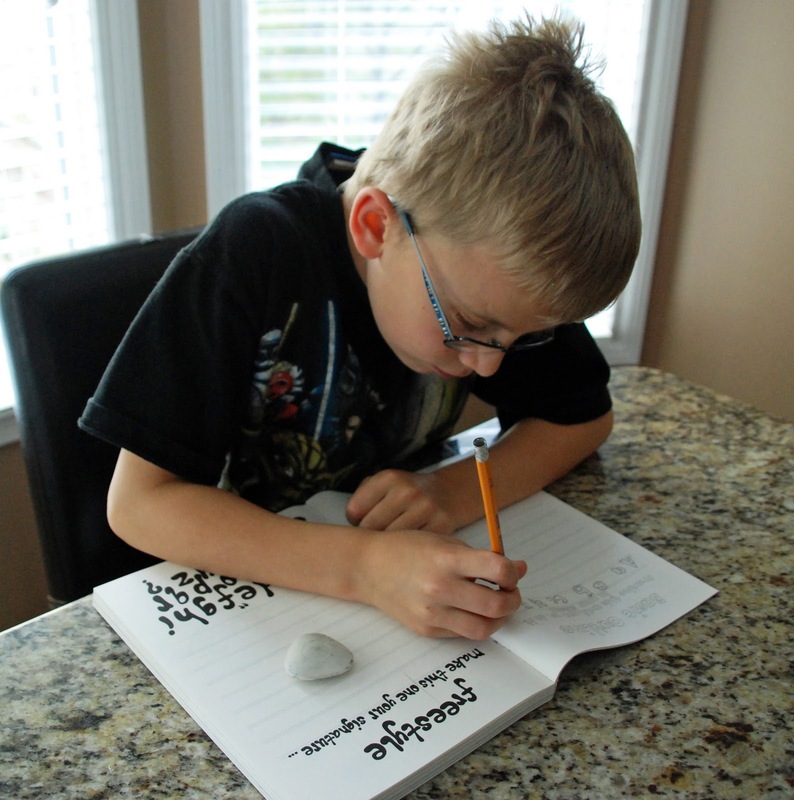 I am impressed that it got your son practicing his penmanship. I wonder if that would encourage one of my children as well. Bubble letters--so fun! I could see us using this a whole lot. Thanks for the chance to win. Thanks so much for sharing your crating ideas for kids, I really enjoy your blog and how your children's art and craft ideas are so thoughtful and beautiful. A lot of ideas on-line are not very inspiring. I teach a small arts and crafts class weekly to a range of children ages 2-10 and your blog inspires me. I can't wait to make the wool felt tree weaving on willow branches, so pretty. My 10 year old would love this book, she is really into making journals and being creative. Thanks for the chance to win. Thanks for the chance for the giveaway! This looks like so much fun! This looks great ... I homeschool and am always trying to find ways to incorporate art and creativity into each and every day. I know my kids would love this one! Awesome! Teaching an early appreciation of fonts! I am sure my 4th graders would be very motivated by this one. Count me in. When I was in 6th grade the only elective class left was the calligraphy one. Turns out, it was one of the funnest and engaging classes I ever took! It forever changed my writing style and I still dabble in calligraphy to this day, but even more I have come to love hand lettering. This would be an awesome book to give as a gift to my niece for Christmas. Oooh, that looks like such a fun book. My daughter loves writing in "fancy" letters, so this would be right up her alley. this looks like tons of fun. My daughter would love it. Oh my 10 year old daughter and her friend would love to take a look at that book. They are somewhat impressed I remember how to do some of that stuff still! hi gail! i know a few people in my home who would love that book to bits (i am one of them!). what a fun giveaway. i read but don't comment here often, so i just want to say thanks for all you do and share with us. So cool! My kids would love it. By the way, we finished our plaster leaf prints today, and they turned out so well. Thank you for the great idea and directions! Great book that I know my students would love. it is great for my pupils actually! Hi Gail...I just discovered your blog. The new book looks great - my daughters would love it...and so would their mummy!!! What a great book! I'm entering - just in case, but I've put this book on my list of books to get (I am NOT lucky... but luck can change can't it?). My grandson is so into making up letters, we can learn together! Sounds like fun! I know my son would like this. Looks awesome for my students! I would love to have this book. My girls and I would have so much fun with it. I'd love to win. This book looks so cool! my kids would love that, and the ones I teach, oh and me too! Looks like a great book, thanks for the chance to win one. I would love to have this book! My kids 13, 10, & 8 have all suddenly become interested in funky fonts and lettering! 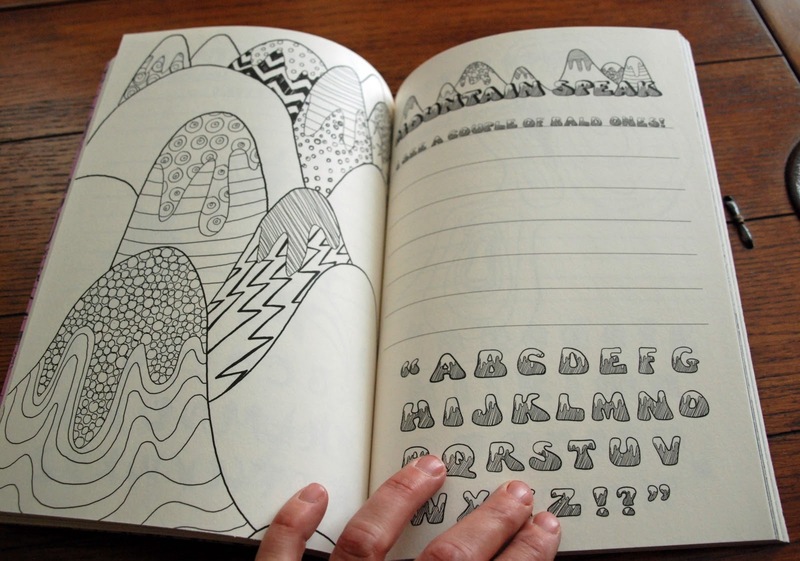 Sounds like a great resource for teaching art as well! I LOVE your blog and detailed pictures of all of the steps! I share it with teachers all the time. More importantly, I am the mom to three boys (like you) who I think would enjoy “getting some practice in.” I hope I win the book! It looks really cool not just for school but for home! Thanks for the inspiration and the chance! What a fun book! I would love to win this!!! I have been following your blog for quiet a while now. You wont believe how much inspiration that has brought to my art teaching! That book! It looks so funny and not at all like aything I ever have seen here i DENMARK, Europe. But anyway Thanks for your blog! What a wonderful book! Who wouldn't want it? Oh, my daughter would LOVE to win this! She's recently discovered how to write "hi" in box letters and would love a whole book on bubble letters. I want to winnnnnnnn! My kids would love this. Looks like a fun book! The kids love "bubble letters". Thinking this would take it to a whole new level! oh please enter me in the drawing. 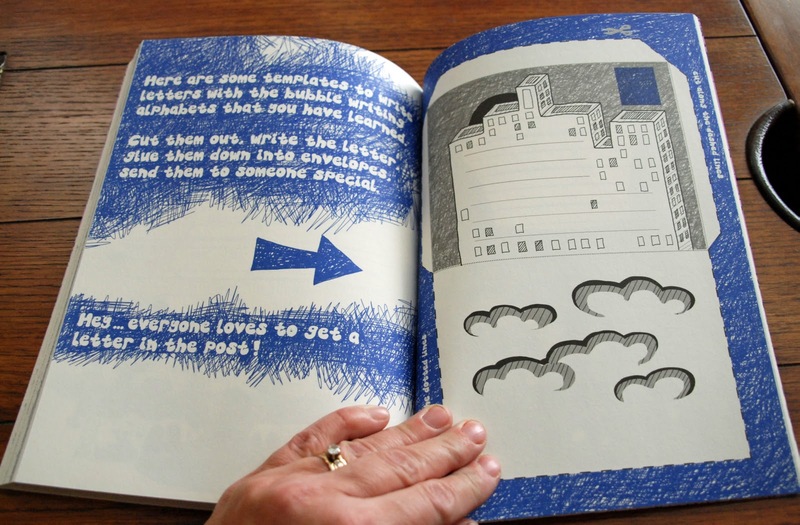 This looks like the perfect book for my elementary art students. Little tricks to make their lettering more fun! What a great book, my granddaughter would love it! What a great giveaway - thank you so much! I know an 8-year old who this would love this (actually, his 10-year old sister probably would too)! Hoping this entry's the lucky one! Also, looking forward to seeing your Remembrance Day ideas... I'm planning ahead and hoping for some more great ideas from your blog! Keep up the great work! This sounds like one fun book! I will have to go check it out either in my bookstore or online. Dana: danainalaska _at_ yahoo. Good addition to any home! Definitely would love to see my son "get more practice in"!! Gail, as always I love to see your new and interesting ideas. I would love to get this book. I love to do lettering and I love it when kids get hooked on it too. 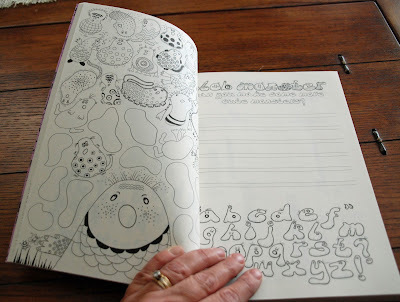 I love your blog and I love bubble letters! I love your blog - but rarely make (or even read) comments. The chance to get my hands on this fun book changed that! Thanks for all your great ideas. You should know I have shared your blog with the student teachers I supervise because your ideas are so good, so beautifully photographed, and so well-explained. What a great book!! I can think of a few awesome ways I would use this book both at home and in school!! Love the concept. We'd have a blast with that book.